Factory Sealed Topps Series 2 Baseball JUMBO Box mit 10 Packs a 50 Cards per Pack. 1 Autogramm und zwei Relic Cards per Jumbo Box ! Produktinformationen "2013 Topps Series 2 Baseball Jumbo Box MLB"
The Chase continues with 2013 Topps Baseball Series 2, with all-new, Chasing History Jumbo Relic and Dual Relic cards, and The Greatest Chase Relic and Cut Signature Relic cards - celebrating Ted Williams' chase for a .400 season. Look for Autograph Relic Cards! 2013 Topps Baseball Series 2 continues the chase started in Series 1 with even bigger hits and more excitement! Key Rookies: Ryan Wheeler, Jose Fernandez, Jackie Bradley Jr., Evan Gattis, Hyun-Jin Ryu, Jedd Gyorko, Brandon Maurer, Rob Brantly, Brandon Barnes. 330 cards featuring Veterans, Rookies, Cy Young Award Winners, League MVPs, Rookies of the Year, and Record Chasers. - GOLD Parallel : Sequentially numbered to 2013. - PINK Parallel : Sequentially numbered to 50. - PLATINUM Parallel : Numbered 1/1. - EMERALD FOIL PARALLEL : Inserted 1:6. - DESERT CAMO FOIL PARALLEL : Sequentially numbered in to 99. 1972 Topps Minis: 50 more mini cards featuring the 1972 Topps design. World Baseball Classic Stars: Featuring 15 of the biggest stars from around the world representing their countries in their World Baseball ClassicTM uniforms. MANUFACTURED RELIC CARDS: 1 Per HTA Box! 1 Per Hobby Case! MVP Award Winners: 10 cards featuring MVP winners with a commemorative MVP trophy embedded in the card. Silver Sluggers: 15 cards featuring Silver Award Slugger winners with a commemorative Silver Slugger trophy embedded in the card. Proven Mettle Coin Cards: Cards featuring 25 superstars, active and retired, with an embedded commemorative coin celebrating their mettle. Proven Mettle Copper - Numbered to 99. Proven Mettle Wrought Iron - Numbered to 50. Proven Mettle Steel - Numbered to 10. Chasing History Autographs: Over 40 subjects. Chasing History Autographs Gold Parallel - Numbered to 10. Chasing History Autograph Relics: 15 subjects. Making Their Mark Autograph Relics: 10 subjects. Cut to the Chase Autograph Relics: 5 subjects. The Elite Autograph Relics: 10 subjects. Signed on-card! Chase it Down Autograph Relics: 5 subjects. 1972 Tops Minis Relics: 5 subjects. Sequentially numbered to 25. Chasing History Dual Relics: cards featuring two players chasing similar history and a relic for each. Sequentially numbered to 50. 20 more individually designed and constructed cards will feature some of the biggest active and retired stars, with an autograph and a unique relic, or a cut signature and a unique relic. 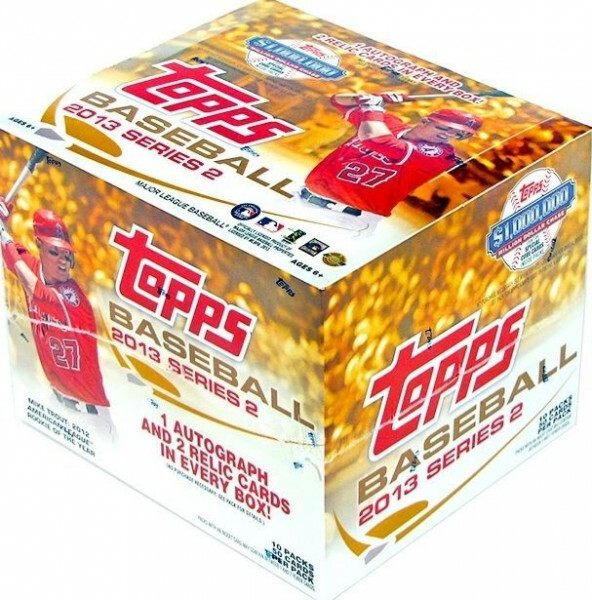 Weiterführende Links zu "2013 Topps Series 2 Baseball Jumbo Box MLB"
Fanbewertungen für "2013 Topps Series 2 Baseball Jumbo Box MLB"